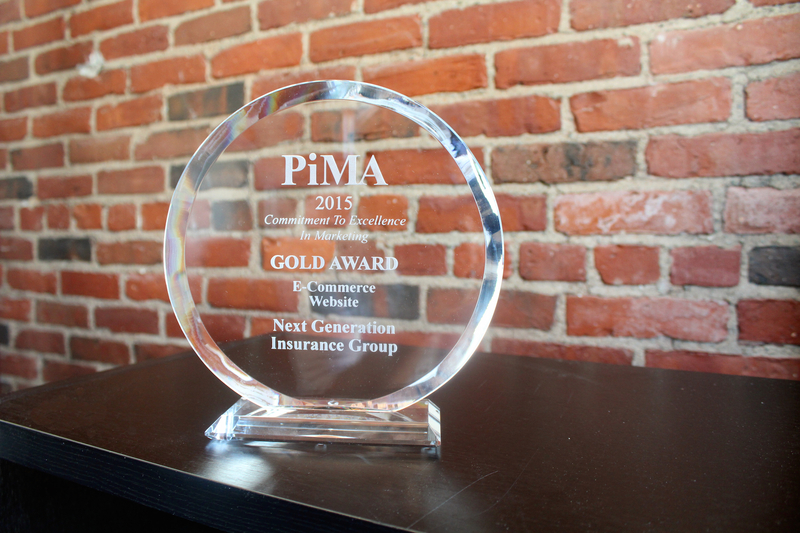 Last weekend at the Professional Insurance Marketers Association MidYear Meeting, we were honored to take home the Gold Award for Ecommerce Website. We are thrilled to be recognized for our efforts, and receiving the award for our Integrated Renters Insurance Program with the University of California – Davis is special to us because of the group effort the project required. The PiMA MidYear meeting started off great for our team members who accepted the award, and they enjoyed the content of the weekend and its many valuable takeaways. We received the Gold Award for an experience we created in response to a marketing problem we faced with an affinity partner. In 2013, we launched a voluntary, co-branded GradGuard Renters Insurance program with the University of California – Davis through its insurance broker, Mercer. UC Davis saw the value in our product and wanted higher adoption among their students in 2014. How could we help? To foster higher adoption among the students and families attending UC Davis, we with the school to create a Renters Insurance program experience that was integrated into their existing housing application process and easy for college families to complete. Much like travel websites mandate consideration of travel insurance at checkout, UC Davis added a mandated consideration of Renters Insurance within their housing application that required a simple Yes/No response from families. The QR code displayed here brought prospects directly to our GradGuard UC Davis microsite. We created a co-branded ecommerce microsite specifically for UC Davis to provide prospects with a frictionless purchase process to complete their opt-in for coverage, and all creative directed them to the site or to call in. Since the prospects were already in the NGI database, responding prospects who either called into our sales center or visited the microsite were placed into an ecommerce purchase experience that leveraged the data in the existing file, by asking for a few pieces of information to match them to the file. Using the file, we were able to simplify the purchase experience for students by pulling in all the relevant consumer information provided by UC Davis. In addition, because a specific coverage amount was pre-selected in cooperation with UC Davis, there were no coverage choices for consumers to make on this page, except for optional earthquake coverage in California. All that was left for prospects to do was enter in their billing information. This award is special to our team: all technology and creative were designed in-house, and we worked across departments to ensure an excellent customer experience from end-to-end that the university approved. This improved process for marketing to UC Davis students not only encouraged greater awareness of the school’s housing policy, risks on campus, and the benefits of renters insurance among the freshman class at UC Davis, it also led to an increase in participation in the program. We are humbled to be recognized by our peers in insurance marketing for our efforts to expand this valuable program for college students.